What is strategy? If you’ve ever researched this question, the name Michael Porter might ring a bell. In fact, Michael Porter’s name has become practically synonymous with business strategy after he created the Five Forces analysis, a tool for analyzing a business’s competition. So, what does strategy mean? Is it all tied into this Harvard scholar’s school of thought? To be clear, professionals think about strategy in different ways, so there isn’t a single clear definition of strategy. However, Michael Porter defines strategy as competitive position, “deliberately choosing a different set of activities to deliver a unique mix of value.” In other words, you need to understand your competitors and the market you’ve chosen to determine how your business should react. Learn more about Porter’s Five Forces to find your competitive position in the market. In his famous article from the Harvard Business Review, “What Is Strategy,” Michael Porter seeks to define strategy through a series of influences. Porter believed that price couldn’t be the only thing influencing strategy. Each of the Five Forces culminates around an industry’s competitive rivalry. To define strategy, analyze your firm in conjunction with each of Porter’s Five Forces. How much does it cost and how long does it take to enter your market? What are the barriers to entry (e.g. patents, rights, etc.)? What does it take to make the business scalable? Have you protected your key technologies? How strictly is your market regulated? If competitors can enter your market with little money and effort, you will need to adapt your strategy to handle any potential rivals. What are the differentiators between your product/service and the substitute? How many substitute products are available in this market? What is the cost of switching to a substitute product? How difficult would it be to make the switch? What products or services can you offer that might substitute a market leader? Think of what the iPod did to the CD market. The iPod used new technology to fulfill the same need that the CD filled for years—giving customers a portable way to listen to music. Price isn’t always the reason that customers switch to a substitute product. After all, the iPod was much more expensive than a CD player, but people were willing to pay a higher price for a device that held thousands of songs. How unique is the product or service that they provide? How many alternative suppliers can you find? How do their prices compare to your current supplier? How expensive would it be to switch from one supplier to another? Remember that your supplier will think strategically, just as you are. If your supplier understands that few other companies could fulfill the same need, they could charge your more for their unique service. How many buyers control your sales? How large are the orders you receive? Could your buyers switch suppliers—and how much would it cost for them to switch? How important is your product/service to your buyers (i.e. what is the ROI of your product/service)? These questions help determine the leverage your clients have to dictate cost. The more customers you have, the more power you retain. How does the quality of their products or services compare with yours? What will it cost one of your customers to switch to a competitor? Remember Microsoft Zune? It was Microsoft’s way to “beat” the iPod. They didn’t. Microsoft discontinued the Zune in 2012. But why? The Zune cost less, was upgraded with every firmware release, and offered a music subscription service long before Apple announced the now-popular Apple Music. The simple answer? Branding. Apple had already established the iPod as the cool, trendy product. Additionally, the iPhone launched six months after Zune’s release, thus replacing the need for the iPod and infiltrating the mobile market. By examining the Five Forces within your market, you’ll have a better sense of where you stand with the competition and how you can adapt your strategy to bring in your target audience. 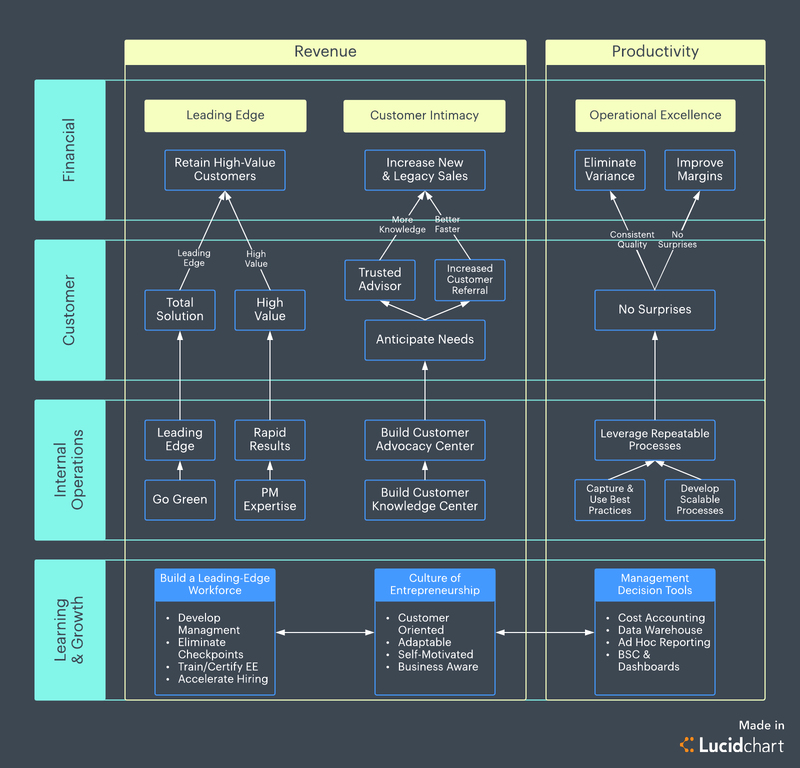 Use this strategy map to visualize your analysis in Lucidchart. So, what does strategy mean now? Porter’s Five Forces devolve into two schools of thought: do what everyone else is doing but cheaper, or do something nobody’s ever done before. Existing businesses can build on what they already do, either finding ways to maximize efficiency or looking for emerging opportunities and new trends. Look at Facebook. They’re the leading social media platform, but they have expanded into messenger apps, chatbots, and the online marketplace as new markets emerged. Essentially, heed every piece of advice you’ve heard on Shark Tank. Find a way to make your product as cheap as possible. However, don’t sacrifice your standards and ensure you sustain profitability. Your customers expect a standard from you. You need to deliver that standard. Remember the GiGo lesson from math: garbage in, garbage out. Never sacrifice product standards for price. Just find a way to get what you need the cheapest way possible. In many businesses, you can streamline processes to cut costs when you diagram and analyze your processes through a flowchart. Brand your product as unique and unparalleled. Or, boil down what industry leaders have done and search for the missing link. What are the next steps? How will your product evolve and outshine the rest? For instance, Vine was a great concept: six-second films as social media. The company launched into the social media space in 2012. They actually gained a lot of popularity. But was it enough to outshine Facebook, Instagram, and Snapchat? Even with Twitter backing Vine, it fell short. Instagram and Facebook realized they could offer the same, short-form video content on their platforms. What is each buyer’s unique need? Is it specific to geography? Do they need a particular product they can’t get elsewhere? How can you position your business to be number one in your customer’s mind? Leveraging your buyers can lead to above-average returns. Always keep in mind what your competitors are doing. Find a way to do it better, cheaper, or differently to suit your buyer’s needs. Hopefully we’ve clarified the elements of strong business strategy. 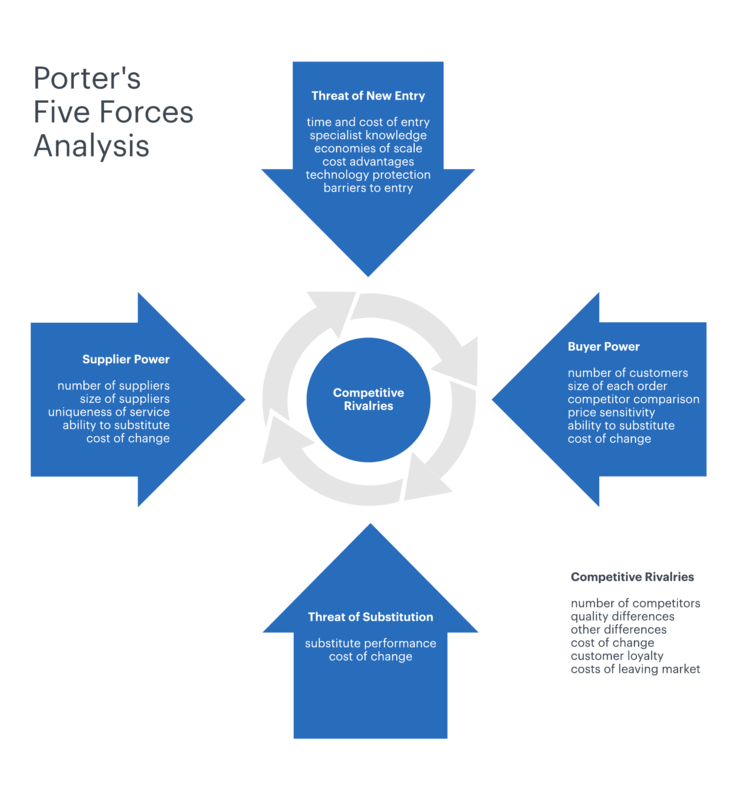 With Porter’s Five Forces, you can find your competitive edge and develop a strategy to move your business to the next level.